Wind erosion can happen anywhere and any time the wind blows. Wind erosion can occur in any area where the soil or sand is not compacted or is of a finely granulated nature. Not only does wind erosion damage the land by drying out soil and reducing the nutrients of the land, it can also cause air pollution. Enveloping crops, covering highways, and invading homes, the sand, dust, and dirt created from wind erosion can impact plant and human life in numerous ways. Wind erosion can result in a variety of types of movement of the soil. These three types different types include suspension, creep, and saltation. Suspension occurs when the wind takes fine particles of dirt and dust into the area and can move said particles over long distances. Creep occurs when soil particles roll over an area and meet particles that have been through saltation. Saltation is the primary means of soil movement. In this process soil particles move across a surface and damage vegetation and soil surface. Wind erosion can cause any of these different types of soil movement, resulting in erosion of the land. Another way of considering wind erosion types is to consider deflation and abrasion. Deflation is the process by which wind moves particles that are loose. Abrasion is when an area is eroded directly by airborne particles. When the wind moves lose soil and dirt particles, this would be an example of deflation. When airborne particles cause land mass to wear away or erode, on the other hand, this is an example of abrasion. Proper crop placement, dealing appropriately with crop residues, and effective planting can all lower the impact of wind erosion. The USDA-Agricultural Research Services and other agencies have created means to protect against wind erosion. Increasing the cohesion of the soil: using organic matter sprayed on top of the soil or increasing irrigation can help the soil to remain moist and stick together. Increasing the surface of the soil's roughness: By creating ridges of appropriate size (less than 40 centimeters high) wind erosion can be reduced. Increasing vegetation: by planting on the land, the ability of the wind to remove soil is greatly reduced. Creating wind-breaks: by arranging the planting of trees around an area, wind erosion can be reduced in two ways. First, the trees can reduce the amount of wind able to reach the soil. Second, the shade reduces evapotranspiration, meaning the soil can retain moisture. Now you have seen lots of different examples of wind erosion and you can better recognize this phenomenon when it occurs. "Examples of Wind Erosion." YourDictionary, n.d. Web. 18 April 2019. 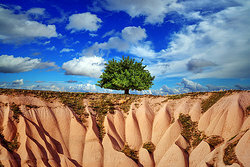 <https://examples.yourdictionary.com/examples-of-wind-erosion.html>.